Editor's Note: IFYE is the name now used to represent the progam/those individuals participating in the program of IFYE Association of the USA, Inc. International Farm Youth Exchange (IFYE) is the correlating program for those who participate in many other countries. Living with six families over three months all while job shadowing is already a unique task. Add in moving to a completely new country and you have the life of Lisa Schmid, an International Farm Youth Exchange (IFYE) student. Schmid, 23, embarked on her international agriculture exchange this past summer where she lived with three families in South Dakota over the course of nine weeks. What made Schmid’s experience unique from the other IFYE students was that she served as the pilot student for a new program - international corporate ag job shadowing. IFYE Association of the USA, an exchange program to place young adults in different rural places across the globe, partnered with Sygenta’s Minnesota regional office to see how exchange students would handle a snapshot of U.S. corporate ag life. Schmid grew up and lives in Stendal, Germany, just a 50 minute train ride away from Berlin. Her brother, a former IFYE student, encouraged her to try the program to broaden her ag knowledge before returning home to work on the family farm. Unlike most of Western Europe, Eastern Germany has fairly large operation sizes similiar to those in the Midwest. Schmid’s family farms several thousands acres of wheat and corn, and works with a small number of livestock. “I was open to everything and my expectations have been completely fulfilled,” Schmid said in an email exchange. During Schmid’s time with Syngenta, she had three jobs. 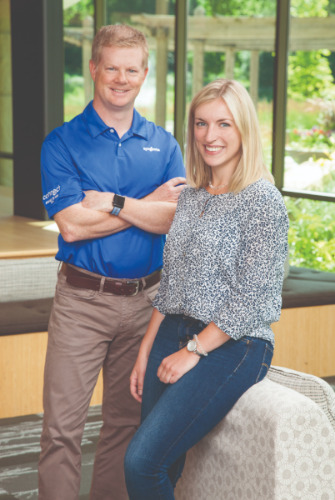 Her first and second week at the company was spent at Syngenta’s Minnetonka, Minnesota regional office. There, she focused on the inner workings of the company and their development groups. Steen is the managing director of Syngenta Ventures, the company’s corporate investment arm. The second week was spent with Steen and his family while he showed her how Syngenta works with smaller companies. Steen said they spent many hours going over how new technologies from start-ups are helping change agriculture. Her final week at the company focused on the research and development side. She moved to Stanton, Minnesota and worked with a sweet corn breeder going over how the company works to better its seed hybrids. “The same problems that our Midwest farmers face here is the exact same as what they’re facing on their farm,” Steen said. Currently, Germany is experiencing a very dry year with low yields. Because of this, Steen said Schmid spoke to him about how they are looking for better varieties of seeds and more specific fungicides and pesticides they can put on their crops all the while managing their input costs in a low commodity market. “They’ve been looking for the same technologies and solutions that we’ve been looking at,” he added. Just one week with each family wasn’t ideal for IFYE’s standard of two to three weeks in each home, but Schmid said she was surprised just how quickly she integrated and became connected with her Minnesota host families. “It was great that I was allowed to have this experience,” Schmid said. After all of it was over, Schmid said she realized that the fast-paced nature of the job helped her hone her problem solving, communication and leadership skills and better understand her own character and how it fits into a new culture. As for Steen, he was just happy that he took the chance on the experience and got to introduce his kids and wife to Schmid and exchange cultures. Steen said his fondest memory was simply driving with Schmid across rural Minnesota and talking about everything and anything. While the point of the pilot was to introduce Schmid to the corporate ag life in the Midwest, she did spend time with three host families in South Dakota experiencing rural South Dakota life - which was the main portion of her IFYE experience. “I was very happy to have families in a second state and to get to know and compare the country life in South Dakota and the city life in Minnesota,” Schmid said. One of Schmid’s host parents, Sarah Hagena of Lennox, South Dakota, said hosting an international student has become one of the great joys of her life. Schmid was their eighth international student since 2010. Hagena’s daughter’s 4-H advisor introduced her to the idea and then she learned of IFYE and has hosted ever since. “We always just do the same kinds of things we do with our family,” Hagena said. Hagena and her family took Schmid to places like Prairie Village and SDSU football games to show her what they do for fun, but also exposed her to their operation, bringing her to check the corn during the growing season. Hagena’s daughters are in college and got to spend some time with both of them and experiencing college-age life on campus. Hagena keeps in touch with all of her exchange students, and has plans to visit them when she and her husband get the chance to travel. For Steen, his experience made him realize how lucky he was to be a part of something that helped push his company and himself to new territories. Steen said he’d definitely be a host parent again if the opportunity came up. “Now that there are three of us who can put our hands up, it was really good,” Steen said. After the entire experience was over and Schmid had returned to her home, she said her biggest regret is not making it west of the river in South Dakota. “It was just a pity that I did not see much of the impressive expanses of the American Wild West; that's what I would have wished,” she said. Before the pilot with Syngenta, IFYE had been looking to branch out their offerings for students looking for a more broad ag experience. But, because of the difficulties finding corporate ag companies to open up for job shadowing, it is unclear if the program will continue outside of Syngenta. Currently, IFYE is taking applications for its exchange program at ifyeusa.org and has been making plans for another corporate exchange program in other countries. While Lambert said not each exchange student will get to do what Schmid did, the entire program depends on finding the right fit for the right job in the country they are going to.